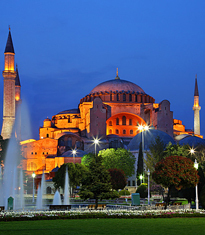 Arrival in Istanbul Ataturk airport and transfer to your hotel. Overnight in Istanbul . P.S : if your flight is from/to Sabiha Gokcen Airport there is 30Euro extra one way per car. 08:30 pick up from your hotel to visit Spice Market and followed by a boat cruise through the Bosphorus, the strait dividing the European and Asian continents, Following lunch break in the afternoon, visit the luxuriously opulent Dolmabahce Palace, the last residence of the sultans. A drive to the Asian part of Istanbul crossing the Intercontinental Bosphorus bridge to visit Camlica Hill The highest point where you can overlook Istanbul and take nice pictures. The tour begins by visiting the remains of the Artemis Temple, one of the seven wonders of the ancient world. 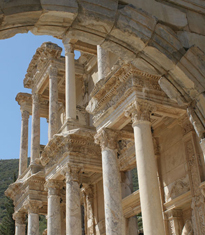 Afterwards, it proceeds to the spectacular main site of Ephesus, undoubtedly the most superbly preserved Greco-Roman city. Unmistakable highlights surviving among the ruins are the Celsius Library, Agora, Theater, Odeon, Trajan Fountain, Domitianus Temple and Roman Latrines. Following a lunch break, visit the House of Virgin Mary; reputed to be where she spent her final days. * Please contact us for upgrade your hotels . Because we can arrange any kind of hotel according your budget.